Doctoral Candidate; from Sahuarita, AZ. Area of Research focus is Neonate to Nurse Communications with the detection of pain to improve outcomes. I had great high school science teachers and the opportunity to take Physiology and Anatomy my senior year. I was completely fascinated with the human body and how it functions to sustain itself. I also wanted to pursue a career where I would be helping people. This made for a natural progression to a career in nursing. You might say that I was in the right place at the right time. I was working as a nurse educator and I routinely assisted UA clinical faculty to place their students in the Neonatal Intensive Care Unit for clinical experience at Carondelet St. Joseph’s Hospital. One day, I spoke with Dr. Connie Miller about furthering my education and expressed interest in informatics. Dr. Miller said that I needed to talk to Dr. Jane Carrington. Within days, I was in contact with Dr. Carrington. We had a meeting that was so inspiring. After learning about Dr. Carrington’s work, I was ready to start classwork that day! Thanks to Drs. Miller and Carrington, I began the application process and started the program in fall 2015. As a local student, I was able to take on-campus (face-to-face) classes in conjunction with my online classes and obtain a minor in Cognitive Science.The knowledge I acquired with classes in artificial intelligence and machine learning along with the mentorship, from Drs. Mary Peterson and Clayton Morrison, within the Cognitive Science Graduate Interdisciplinary Program (GIDP) were invaluable. Furthermore, classes in informatics along with my minor classes broadened my knowledge base to the innovative application of artificial intelligence and machine learning in nursing to improved patient outcomes. My advisor, Jane Carrington, formed a committee of scholars for her advisees, the Carrington’s Cats. My favorite memory has to be with the scavenger hunt that I did with the Carrington’s Cats my second year of RISE. The scavenger hunt took us from the College of Nursing to McKale Center, the Student Union and UAHS Library.I believe we had 19 clues to find specific objects and take a picture of the object with the team and tweet #RNsRISE and #Carringtoncats. This provided an opportunity to meet one another and promote team building while having a blast! My area of research seeks to increase effective neonate and nurse communication of pain. Here I blend passions with neonates, informatics, and advanced technologies. As a neonatal nurse for several years, I have witnessed the suffering of neonates due to the current pain standards of care.I truly believe we can do better to serve this vulnerable population. 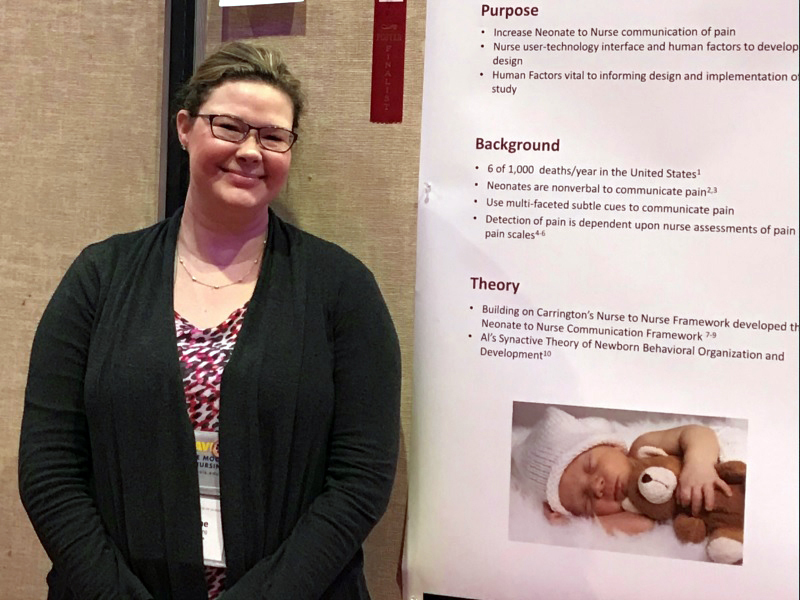 Through informatics and advanced technologies in artificial intelligence and machine learning, we can give a voice to neonates to increase effective neonate to nurse communication and ultimately improve outcomes.